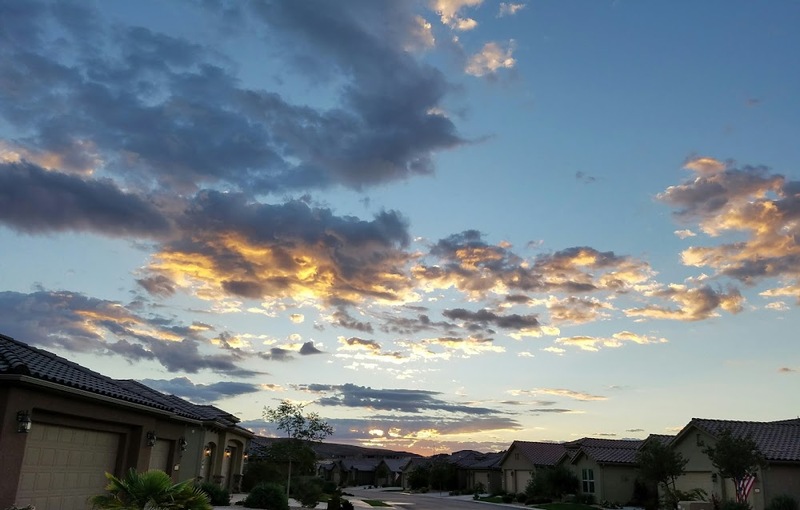 I didn’t think it was possible to surprise myself after all these years of living with me, but I have. 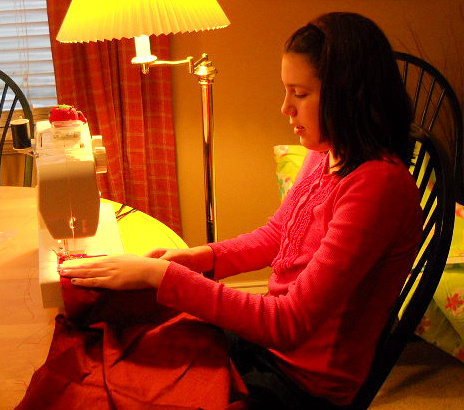 It started with a Christmas gift idea: a sewing machine for my grand-daughter, 11-almost-12-year-old Taylor. Along with the machine, I gave her a pattern and fabric, plus I volunteered to help her sew a skirt. After 20 years of NOT sewing, the excitement for sewing again grew as I searched for a simple skirt pattern and fabric. And then as Taylor and I cut out the skirt and started sewing the project, the urge to tackle my own project grew even more. This was shocking because I have never LOVED the hobby. There was a time early in our marriage when I sewed a lot. We were poor students living in Kearns, Utah, and sewing our clothes saved money. Fortunately, we lived in a neighborhood where seamstresses flourished, and they were willing to help this neophyte learn the art. I sewed Gary's suit, my blouse and jumper, and the boys' slacks - that you can't see. 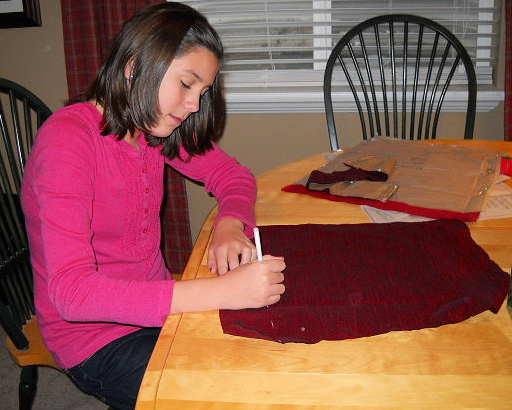 Although I sewed for a few years more, I didn’t dedicate myself to it like I had before. You see, I was a slow seamstress. I often had to pick out nearly every seam that I stitched. I also sew like I cook/ Where every meal looks like I am creating Thanksgiving dinner, every sewing project looks like I am working away in a cluttered sweat shop with DOZENS of laborers: scraps of fabric lie here; thread is strung there; and pins are scattered everywhere. It is also stressful! 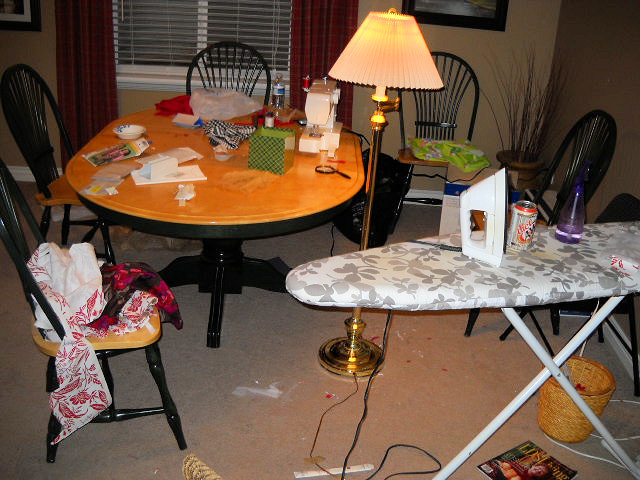 Sewing may relieve stress for people like my sister, but NOT for me! Nevertheless, as I worked with Taylor on her skirt, I enjoyed a growing sense of satisfaction that I could remember as much as I did about the nuances of sewing well. I also loved the creative spirit that welled up inside me as I watched Taylor sew seam after seam. It was so rewarding that I decided to make grand-daughter Mia a jumper for her 5th birthday AND also create a matching jumper for her American Girl doll! BUT it didn’t take long before I remembered all the reasons I disliked sewing: threads breaking every 10 stitches, re-threading the sewing machine needle a dozen times (and my near-sighted eyes are SO MUCH WORSE than they used to be), and picking out mistakes again and again. By the time I finished, however, I was DANG PROUD! The jumpers turned out so cute that I didn’t even mind the hours that I poured into them or that I had to make the doll’s t-shirt twice. (I sewed the sleeves to the bodice on the first attempt and trimmed the seams so I couldn’t salvage it! The malformation would have looked good on an alien!) In the end, the outfits FIT perfectly! YaY! YaY! YaY! 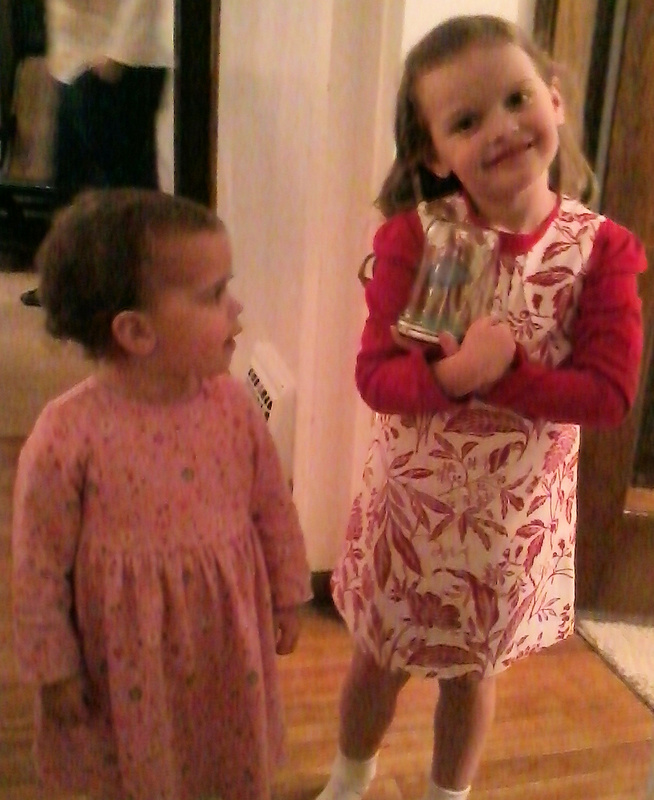 Mia and Julie; I also sewed Julie's t-shirt and leggings! 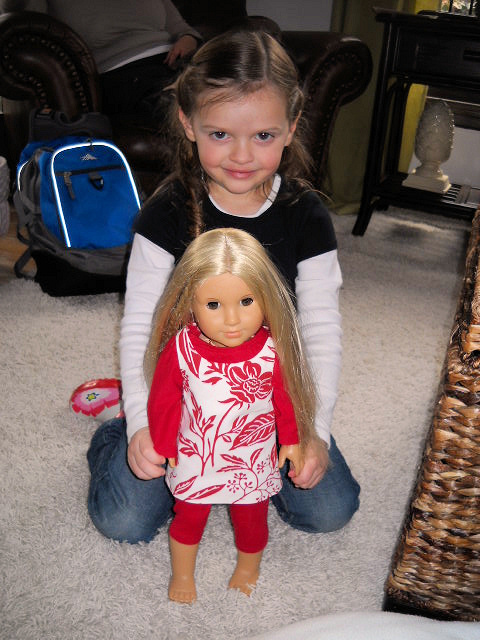 Another epiphany burst upon me when I re-found this mini-talent: Having reared 4 boys, I had NEVER sewn for little girls OR dolls – except that sweatsuit I made for a Cabbage Patch doll named Mikey that belonged to a certain son who shall remain nameless. But that’s another story! Categories: ... my family life ... | Tags: Hobbies, Polyester, Sewing, The 1970s | Permalink. I love it!!!!! I used to love to sew as well, but never made Jim a suit! I am so impressed. I’ll never tell Jim that he missed out on a leisure suit…..I need to start sewing for grand daughters as well. I started piecing quilts about 10 years ago and that was very satisfying, but I haven’t done that since my work has picked up so much over the last few years. Renae, you are absolutely amazing! I’ve GOT to dig up the picture of the leisure suit! Forest green with white top-stitching!!! Green and gold plaid bell-bottom pants! Mile-wide tie with a knot as big as a softball! Classic! Quilting IMPRESSES me! I bought fabric to make a baby quilt YEARS ago! It’s still in the bag, still in a drawer! Maybe I’ll finish it for a GREAT grandchild! I’ll post pictures when the project is finished. She’s a busy girl with basketball, babysitting, school, etc. We hope to finish it over the next weekend. She is a darling and VERY tall (5’6″ at age 12. Her dad is 6’6″, and her mom is 6′!) 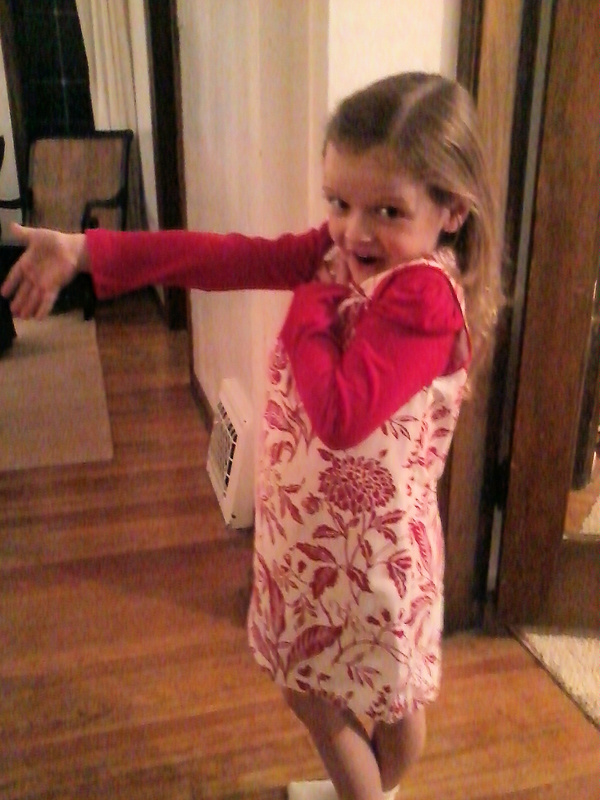 I wanted her to know how to sew b/c she’ll have hard time finding clothes that fit! 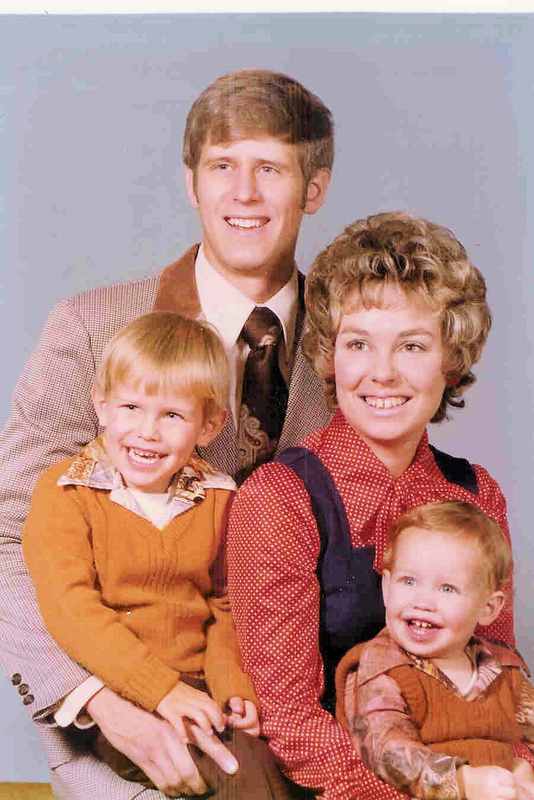 I love that family picture–especially the bow on your blouse! Those jumpers look amazing and such cute fabric! Don’t you think one of your children looks a little like little Andy? And do you like the way I coordinated our outfits? Brown, navy, and red? Polka dots, hounds-tooth, and who knows what patterns are on the boys’ shirts? The picture is nicely well color coordinated–don’t know how I missed that before, Ahem. Anyway I said to Andy that I thought Maegan looks like him in that picture, but maybe it’s just the age. But I see it through the bright eyes! I love this post, dear friend. I had forgotten your life as a seamstress—or maybe I never knew! I did make a quilt for a great-grandchild here in South Africa, so I had to comment. Sorry to be so slow—but time flies by. I remember that picture of your family—ahhhh so cute–all of you. Good luck with the sewing – anxious to see how it all turns out. I have been bitten by the sewing bug here in SA—not enough to do in the evening I think –no TV!